Just another "average" Kvichak rainbow. The drift looks good, drag-free, as I intently stare at the little black and white indicator. It stops for a second and then disappears with a violent tug. The line slices through the water upstream--fish on! I set the hook with a downstream sweep of the rod tip, and then let the fish run. About twenty yards from the boat a nice rainbow makes the first of four or five jumps, then runs back towards the boat. Reeling like mad, I try to take up the slack. As the fish sees the boat, it is off again on another run; this one a bit shorter than the last, but stripping line against the drag. Back and forth we go for a few more minutes, then our guide, Hayden, nets a beautiful 23-inch rainbow trout. Any other place I would be ecstatic; it would be worthy of a picture and an exact measurement, but I'm on the Kvichak River in Alaska. This fish is briefly admired and released; we have bigger fish to catch. The Kvichak is a unique fishery. This river is the outflow of Lake Iliamna, about 250 miles west southwest of Anchorage on the mainland of Alaska. 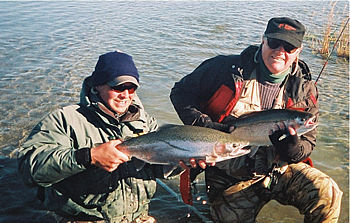 It flows about 65 miles into Bristol Bay on the Bering Sea, and supports strong runs of Pink and Sockeye salmon. These, in turn, feed the Lake Iliamna Rainbows who routinely grow to 25+ inches. The rainbows of the Kvichak over-winter in the lake; enter the river to eat salmon smolt and spawn in the late spring; then return in the summer to follow the salmon and feast on salmon eggs. They lie in the river below the redds and enjoy an almost constant supply of food. There are many trophy fish exceeding 30-inches to be caught, but they are not easy. The power of these fish grows exponentially with each additional inch. When they hit the fly, everything has to be right, or they just keep going. 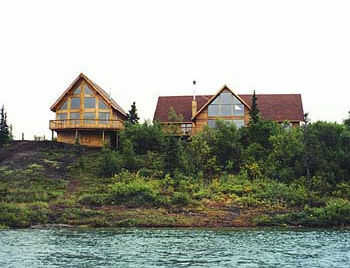 I am staying at the Alaska Sportsman's Lodge right on the river. This is a first class accommodation that provides an incomparable experience. There is room for 16 guests in eight comfortable cabins. The guides are available to take you out on the Kvichak at most any time, and all the fishing is guided'one guide and two fishermen per boat. All of the rainbow fishing is catch-and-release with single hook artificial lures, and most people fly fish. The guides know the river and how to get you into fish, but if you get tired of hooking monster rainbows, or want to take some fish home, the lodge has two deHavilland Beavers on floats to fly you out to other fishing spots for silver salmon (Coho), trout, char, or just to see the bears. Everything is included in your stay. I went to the lodge with my friend Jim McGovern and his sons Michael and Patrick. They had all been to the lodge before, in fact Jim and Michael had been there every year since it opened in 1996. Jim had been talking the lodge up for over a year, and I took him up on his offer to let me tag along. Owner Brian Kraft has created a masterpiece with the Alaska Sportsman's Lodge. The ambiance is spectacular; the food outstanding and the service beyond impeccable. The Lodge makes a big deal of catching a "trophy" rainbow, defined as over 30 inches. Anyone accomplishing this feat is awarded a hat and gets their name on a plaque and may get their picture on the wall-of-fame. We arrived on Saturday afternoon, September 11, from Anchorage via charter plane'another included feature of our stay. After a brief orientation we were served hors d'heurves and wine, a daily ritual at the lodge, followed by a sumptuous dinner of grilled steaks. After dinner, Brian took Jim and me out on the river for a couple hours of fishing. We were both introduced to a couple of the "average" trout around 23 inches. By Sunday afternoon the jading starts to take hold. These 23- to 24-inch trout, that would be trophies anywhere else, begin almost to be a bother. Release them and get that fly back in the water; we're after the Hat! "Hat fish" are not easy, you rapidly find out. You can hook them, but it ain't easy to hang on. They are masters of spitting out, breaking off and generally avoiding being boated. By Monday noon I had probably had six of the over-30s on for at least a second or two, but that was all. Fishing together, Jim and I had a double of potentially trophy (hat) fish. Hayden pulled the boat over to the shore to do the landing. 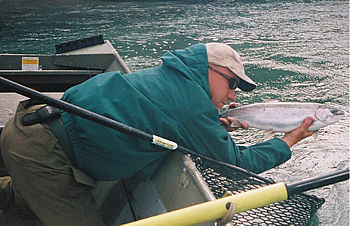 The guides do this for the big ones, since the water is cold and they don't want to look terribly uncool, falling in. Actually the guides are very concerned about the safety on these magnificent fish and want to be sure they can release them unharmed. It is much easier to do this with a big fish if you are standing on the ground. As we fought the fish, he was trying to figure out what to do about two simultaneous, trophy-sized fish. Just then he saw another guide, Chris, motoring up the river without clients, and called him over. Before Chris could get there, Jim's fish was ready for landing and Hayden scooped it up. I heard him tell Jim to open his bail (yes, he was spin fishing). 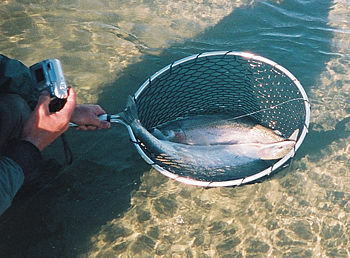 He was then over landing my fish; two 26+-inch trout in one net. They turned out to be 26.5 and 27 inches each. Not hats, but really respectable fish, nonetheless. One of the things that I wanted to make sure to do on this trip was to catch something substantial on my Spey rod. Tuesday afternoon we planned to fly out to the Big River for some silvers and bear-watching. About 11am we came in from the Kvichak and loaded up in one of the Beavers to make the 1-hour flight over to the coast. 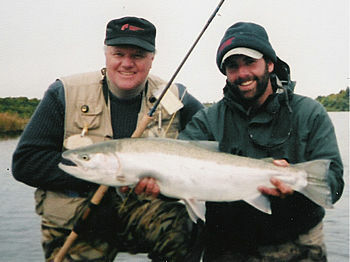 The Big River is directly facing Kodiak Island and was still hosting fresh silvers from the salt. This was our opportunity to get some fish to bring home. 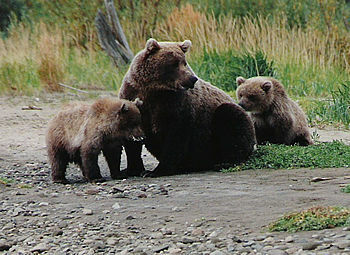 The Big River isn't; but it does have a nice run of silvers and a lot of brown bears. They are fascinating to watch, cruising around in the water, no more than fifty yards away, catching their own salmon. There was a Mama and two cubs amongst the group, great to look at, but given wide berth. I took the Spey with me to experience a big fish on this rod. Silvers are easy to catch, but they give a good fight. It was fun to experience this on the Spey. It is true that you really need a ghillie to land a big fish with this long rod, but we had the guides and they did a great job as usual. 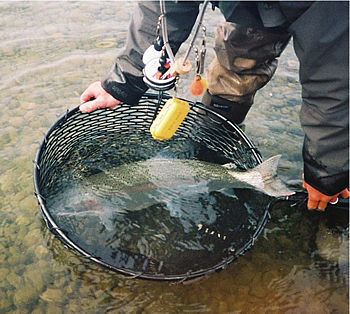 I caught about ten good-sized silvers on the Spey. We finished up down near the planes to catch the fresh ones just coming in on the high tide. These fish were really lively. I adapted the hand-over-hand, saltwater retrieve on the Spey to simulate a spinning rod and landed three more. The limit for silvers in this river was five each. We brought them back to the lodge where they filleted, froze and boxed them to take home. Again, fantastic service. Wednesday morning, Todd, the head guide, suggested that I might want to try the Spey on the rainbows that afternoon. He said that there were some good gravel bars that were conducive to Spey casting, and that he would take me there after lunch. Wednesday morning was pretty cold and the fishing didn't really warm up until around eleven. I finally hooked into a good fish at about noon, but he still wasn't hat-quality-only 27-inches. After another half hour or so we headed into lunch. After lunch and a short siesta, Todd and Chris took the McGoverns and me out for the afternoon. The plan was that they would leave me at various Spey-fishable bars and float the areas, checking back to see if I needed anything. I think the general opinion was that they were amusing the guy with the long rod and the funny casting style, not that it was a viable method of fishing. Nonetheless, Todd told me to use a sink tip and provided me with a fly that was a combination egg pattern/sparkle flesh fly -- sort of an Egg-Sucking-Flesh-colored Leech. I have to admit that I hadn't practiced Spey casting a lead core tip, and I found myself flailing around for a bit. Finally after about five attempted double-speys, I laid one out nicely, about 75 feet into the stream. Feeling fairly proud of myself, I threw a mend into the line and started to follow the swing. About two-thirds of the way through the swing, it was hit like a ton of bricks. With my reel screaming, I looked at the line entering the water. Suddenly about fifty feet upstream, a massive rainbow leapt from the water. I hung on, using the leverage of the long rod. We went back and forth, me reeling in, the fish stripping out for about twenty minutes. Finally as the fish tired, Todd told me to try to bring it into the deeper channel behind the bar from which I was fishing. As he stood there with the net and got a good look at the fish he turned to Mike McGovern and said, "Better get the Box!" (their large-fish measuring device). At this point I knew I might have something. A few more minutes and the fish was netted; I knew I had something. This guy stuck out of both ends of the net. The Box pegged him at 31 inches, with a 19-inch girth. What a fish! Apparently, no one had ever caught a "hat fish" with a Spey rod at the lodge before. We took lots of pictures. Hooted and hollered and carefully released that beauty back into the stream. He swam off majestically. I caught two more with the Spey; one 24-incher at the same spot and another good 25+ on a different bar. It took me in to the backing twice. While I was fighting it, Todd and the boat were nowhere to be seen. Just as I got it to the point of wondering what the heck I was going to do with it, he and Mike motored up. I flagged him over and he netted the fish. Not a bad afternoon's work.